Representatives from 12 South American countries have signed an agreement to create a political and economic bloc modelled on the European Union. The new South American Community of Nations was launched at a summit in the Peruvian city of Cuzco. Peruvian president Alejandro Toledo, said a new country was being born, which would one day have a common currency, parliament and passport. Members of the new community will start by phasing out tariffs. Leaders also hope it will increase South America's clout in international trade talks. Mr Toledo said the new community would also help member nations "confront the challenges of globalisation so that it is fairer". "If in the past, geography divided us, today it unites us," Mr Toledo said. The move will create a market of 361 million people with a GDP of $973bn, exporting $181bn of goods and services. But the BBC's Hannah Hennessy in Cuzco says details and disputes must be resolved if the bloc is to live up to expectations. It is born from the convergence of the two main trade groups of the region - the Andean Community (Can) and Mercosur - as well as Chile, Surinam and Guyana. The Can was created 35 years ago, but it still has not decided on common tariffs for its members. Critics say that if existing blocs have not been able to achieve unity, this one stands little chance of doing so. There have also been criticisms that countries are putting their own interests first. 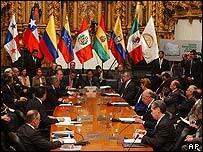 The presidents of Brazil, Venezuela, Peru, Colombia, Bolivia, Chile, Surinam and Guyana attended the summit. The leaders of Argentina, Ecuador, Uruguay and Paraguay did not even bother attending the summit, sending envoys in their place. Others left before the signing of the declaration. In trade terms, there is also scepticism. 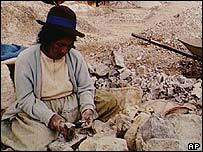 Some analysts note that in many cases the South American countries export the same products. The region's two biggest powers, Brazil and Argentina, are currently locked in trade disputes, while Bolivia and Chile have no diplomatic relations at all. However former Argentine president Eduardo Duhalde brushed aside the sceptics, saying the new group would not only responded to a very old integration dream but also to modern requirements. "Our countries cannot face alone the challenges of the new economic and political world order," said Mr Duhalde. To emphasise this move towards greater integration, Peru and Brazil signed a $700m agreement to create a road linking the two countries to be finished by the end of his term in 2006.